Valentine’s Day will be upon us quite soon and perhaps this is the year you sweep your whole family up in this loved-up celebration … in a very donutty way?! Let’s face it, Valentine’s Day shifts a little when you become a parent. Of course there’s still plenty of room for cute cards, lovely flowers and date nights, but there are little people in the midst of all this. With that in mind, why not include them and redefine this smoochy day a titch?! For one, this gives you a brilliant excuse to talk about how special everyone in your family is – when they’re not putting the remote in the toilet or lying in the middle of the supermarket screaming for a Freddo Frog or tapping you on the shoulder like a tiny ghost at 3am. Also? It gives you a cute opportunity to get crafty and make cut-out hearts and sweet cards and things. Glue sticks for the win! Thirdly? Adding kids into some bits of your Valentine’s Day celebrations allows you to order 12 heart-shaped iced donuts to be delivered to your home thanks to Krispy Kreme! Yessss! Krispy Kreme in Australia have Sweetheart Packs of donuts ready to order for delivery right now. They are super cute and look very delicious. They’re also guaranteed to delight your little loved-ones. In the US, Krispy Kreme have taken things up a notch. Their Valentine’s Day donuts are based on conversation hearts – those cute heart-shaped lollies that have sweet messages stamped into them. Not gonna lie, we’re pretty jealous of our US donut-loving counterparts. But the Australian version are still pretty great and definitely would be welcome on our kitchen table. 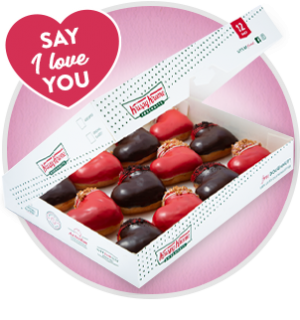 “You can’t eat flowers!,” Krispy Kreme points out, noting that these Sweetheart Packs contain 6 Chocolate Heart and 6 Strawberries & Crème Heart donuts. Yummm! These heart-shaped donuts are available to order online until 12pm AEDT Wednesday 13 February and cost $26.95. Note that you’ll need to check whether you’re in the delivery zone.